Sylvania. The gorgeous George’s River running by your feet, the sun setting over the water in a haze of glory and the natural beauty around you within touching distance of Sydney’s centre. All this and more at your door step so what’s holding you back? If the answer is back or neck pain then you need to turn to Sydney Wide Chiropractic to set you on a path to renewed energy, vitality and wellbeing. Our team, together combining for the leading specialist chiropractor in Sylvania, have extensive university training and practical experience to be able to identify and help your individual needs, whether you suffer from back or neck pain to more local pains like headaches, sports injuries or chronic pain, we have the treatment program to suit your needs. We are committed to assisting all of our clients on the path to greater health and wellness and to achieving all their personal health goals. We don’t simply isolate the symptoms and treat them in a cycle of ongoing and costly chiropractic care, in contrast we help educate and inform as to the root of the problems and equip you with the skills to self-heal going forward, that is our commitment to you. Our mission is simple, as the premium chiropractor in Sylvania we target effective and efficient treatment outcomes that exceed expectations and set you on a healthier and happier life course. We constantly look to further our success with an ethos of respect underlying our pain relief services. As a cost effective and safe health care plan we offer the most successful and most valuable service on the market. Our friendly and welcoming environment sets the tone for your enhanced health and wellbeing and we pride ourselves on our track record of success with over 11 years healing Sylvania. 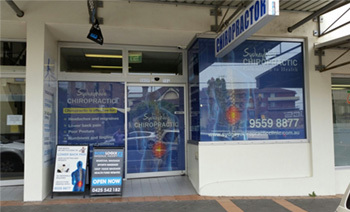 So if you’re ready to talk to a chiropractic service that is natural, safe and most importantly life changing, then give us a call today on (02) 9529 4008 or email us at info@sydneychiropracticclinic.com.au to start your treatment now.